Nelson Newton Glazier, son of John Newton and Phebe Cass (Bourn) Glazier, was born December 12th, 1838 at Stratton, Windham county, Vermont. His education was acquired in the common schools, Leland Seminary, Amherst college, 1858-61; and at Brown University, Providence, Rhode Island, 1864-66. Here in 1866, at the time of his graduation, he received the degree of A. B. and from there in 1869 the degree of A. M. Three years also, 1866-69, were passed in study at the Newton Theological institution, Newton Center, Mass. 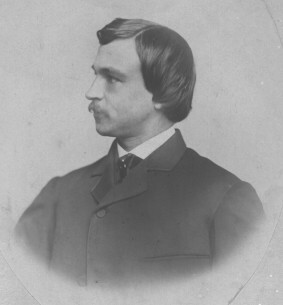 In 1865, while a senior at Brown University, he was elected representative to the Vermont legislature from his native town and served on the committee on education. This honor was conferred on him in 1867, when a student at Newton Theological institution, and he was made a member of the committee on elections. Mr. Glazier, August 11th, 1862, enlisted in Co. G, 11th regiment, Vermont volunteers, afterwards the First Artillery, Eleventh Vermont Volunteers, and served as private, corporal, and for a time acting ordnance sergeant at Fort Slocum, and for months on recruiting service in Vermont. He was made Second Lieutenant of Company A, November 2, 1863, and became first lieutenant of the same company January 21, 1864. He lost his left arm at Spotsylvania, Va., May 18, 1864, and was honorably discharged September 3, 1864, on account of wounds received in action. In June, 1920, he became a member of Rawlins Post No. 35, Department of Nebraska, G.A.R., Beatrice, Nebraska. February 3, 1904, he joined the military order of the Loyal Legion of the United States, Commandery of the state of Massachusetts. A man of patriotic spirit and love of his country, his services have been much in demand, especially as a Memorial Day orator. From 1872 to 1875 he was superintendent of common schools at Montpelier, Vt. From 1872 to 1878 he was for three consecutive biennial terms, Chaplin of the Vermont State Senate. He was ordained to the work of the gospel ministry (Baptist) at Central Falls, R.I. He had pastorats at Central Falls; Montpelier, Vt.; South Arlington, New Whitman, Mass. ; Westboro, Mass. ; Greenfield, Boston, Mass. The last fifteen years of his life as a retired pastor were spent with his blind sister, Czarina Abigail Glazier Williams, then 92 years of age, at Beatrice, Nebraska; Muscotah, Kansas; and Ashland, Nebraska. He died at Ashland, Nebraska in the fall of 1922 and was buried at Willow Creek Cemetery north of Prague, Nebraska.